Saint Anthony of Egypt | whydocatholicsdothat.com Blog– Pray. God is waiting. 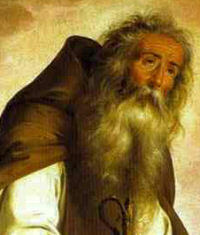 St. Anthony, the father of monks, retired to the desert at about the age of eighteen in order to live in perfect solitude. He laid the foundations of community life, and gave to his disciples that profound broad and sane instruction, the mature result of solitude and prayer, which forms the surest basis of Christian asceticism. Anthony “the Great”, the “Father of Monks”, ranks with those saints whose life exercised a profound influence upon succeeding generations. He was born in Middle Egypt (about 250) of distinguished parents. After their untimely deaths, he dedicated himself wholly to acts of mortification. One day while in church he heard the words of the Gospel: “If you wish to be perfect, go, sell what you have, and give it to the poor” (Matt. 19:21). It seemed as if Christ had spoken to him personally, giving a command he must obey. Without delay he sold his property, gave the proceeds to the poor, and went into the desert (about 270). When overcome by fatigue, his bed was the hard ground. He fasted rigorously, ate only bread and salt, and drank only water. Nor would he take food before sundown; at times he passed two days without any nourishment. Often, too, he spent whole nights in prayer. The saint suffered repeatedly from diabolical attacks, but these merely made him more steadfast in virtue. He would encourage his disciples in their struggle with the devil with such words: “Believe me; the devil fears the vigils of pious souls, and their fastings, their voluntary poverty, their loving compassion, their humility, but most of all their ardent love of Christ our Lord. As soon as he sees the sign of the Cross, he flees in terror.” He died in 356 on Mount Kolzin by the Red Sea, 105 years old. A year later his friend, the fearless bishop and confessor St. Athanasius, wrote his biography, which for centuries became the classic handbook of ascetics. As seen by St. Anthony, the purpose of asceticism is not to destroy the body but to bring it into subjection, re-establishing man’s original harmonious integrity, his true God-given nature. Patron: Amputees; animals; basket makers; basket weavers; brushmakers; butchers; cemetery workers; domestic animals; eczema; epilepsy; epileptics; ergotism (Saint Anthony’s fire); erysipelas; gravediggers; hermits; hogs; monks; pigs; relief from pestilence; skin diseases; skin rashes; swine; swineherds.